Aimee Greenberg is totally fine with waiting. As an actor, writer, director and a veteran theatre artist whose work has been produced in Europe, Asia and the United States, she knows it comes with the territory. Waiting is a central theme in most people’s lives, but never so predominant as in Samuel Beckett’s masterpiece Waiting for Godot, where two men wait endlessly for the arrival of a third. Godot has been produced numerous times and in numerous languages, most recently on Broadway starring Ian McKellen and Patrick Stewart. 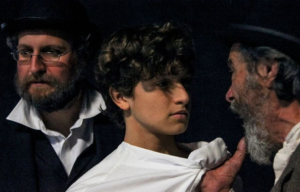 And now Greenberg, who founded fruitlessmoon theatreworks in 2013, brings Waiting for Godot to San Diego, March 25-April 10 at the White Box Live Arts space within NTC at Liberty Station. Greenberg, who wrote Light Falling Down, a piece inspired by stories of women Holocaust survivors and (presented at Oceanside Theatre Company); acted, directed and co-produced Occupy the Rice Fields (an original piece about Greenberg’s experience in Bali presented at Space 4 Art and North Coast Rep); and directed and produced A Midsummer Night’s Dream in Zoro Garden, Balboa Park; is not afraid of taking on that challenge. After surviving World War II in the French resistance, Beckett wrote Godot, pulling from his personal experience in a world similar to our own, Greenberg says. “We have terrorism, global dissent, we have a serious refugee problem [today]; there are horrors of today that this play speaks to,” she says, noting that this isn’t the first time Waiting for Godot has traveled to countries where genocide or disaster was prevalent. In 1993, American writer and political activist Susan Sontag produced Godot in civil war-riddled Sarajevo, and more recently, the work was produced in New Orleans post-Hurricane Katrina starring two African-American actors in the title roles. Godot was even produced in California’s San Quentin State Prison to prisoners who, for obvious reasons, could sympathize with the characters’ endless waiting. Whoever Godot is for Greenberg, it doesn’t truly matter. Fortunately, San Diego audiences will not have to wait much longer for Greenberg’s production of Godot. She has cast an amazing group of local actors: Joe Powers as Estragon; Tom Steward as Vladimir; Fred Harlow as Pozzo; Don Loper as Lucky and Jordi Bertran as the Boy; to bring the timeless tale to life this month. Tickets are available at godot.eventbrite.com or at the door.